A lithium-focused company adds land at its major projects and submits permit applications. Piedmont Lithium Ltd. (PLL:NASDAQ; PLL:ASX), a lithium-focused energy company, recently announced that it has increased its exploration land position, bringing it to a total of 1,383 acres. Properties within the Carolina Tin Spodumene Belt (122 acres). Preferred locations for its concentrator and mine infrastructure (49 acres). Land position at Piedmont Lithium Project increased by 15% to 1,383 acres. Core Property expanded by 93 acres or 18% to a total of 622 acres. Contiguous land acquisitions are along strike. Mineral resource drill targets are being finalized and will be incorporated in upcoming Phase 4 Drill Program. All deals structured as options or deferred purchases to minimize upfront cash outlay. In the map below, the navy blue areas reflect the Piedmont Lithium project. The red areas represent the company’s new land holdings. In additional to the expansion, Piedmont Lithium also controls a 60-acre parcel in Kings Mountain, North Carolina, for the site of its planned chemical plant. The company explained that in to minimize the use of cash, all of the land additions are controlled via lease/option or deferred purchase contracts with local landowners. Not only is the surface property included in these contracts but so are the associated mineral rights from the local landowners. As of June 2018, the current resource has 16.2 million tons @ 1.12% Li2 on the flagship Core Property. Two properties purchased under the recent land expansion have significant potential to add to this resource, according to management. On January 9, Piedmont announced that it submitted a Section 404 Standard Individual Permit application to the U.S. Army Corps of Engineers, the lead federal agency for the permits, for the Piedmont Lithium Project. At the same time, it submitted a Section 401 Individual Water Quality Certification application to the North Carolina Division of Water Resources. To support its flagship project, Piedmont Lithium announced mid-December 2018 that it had completed the first tranche of its placement of 111 million shares at an issue price of AU$0.11 per share. The second tranche of the placement (3.4 million shares to directors for gross proceeds of AU$0.4 million) will be issued subject to shareholder approval. Piedmont has also changed its NASDAQ ticker symbol. In mid-December, the company announced that NASDAQ had approved the change of the ticker symbol for the company’s American Depositary Receipts (ADRs) to PLL from PLLL. The change means the ADRs on the NASDAQ will now match the ticker symbol for the company’s shares on the Australian Securities Exchange. Piedmont Lithium has caught the attention of industry analysts. Brien Lundin, in the December-January issue of Gold Newsletter, noted, “According to a recent PEA Piedmont produced on its lithium project, it offers a low-cost supply of spodumene. Its $193/tonne net cash costs put it at the low end of cost curve for the world’s lithium concentrate projects. That’s also true of the cash production costs for lithium hydroxide from the project. Those are estimated at $3,111/tonne versus about $5,300/tonne for a typical spodumene mine and $6,165 for a lithium brine operation. . .To give you a sense of the potential here, the PEA pegged the project’s after-tax NPV at $888 million, or more than 17 times Piedmont’s current market cap. 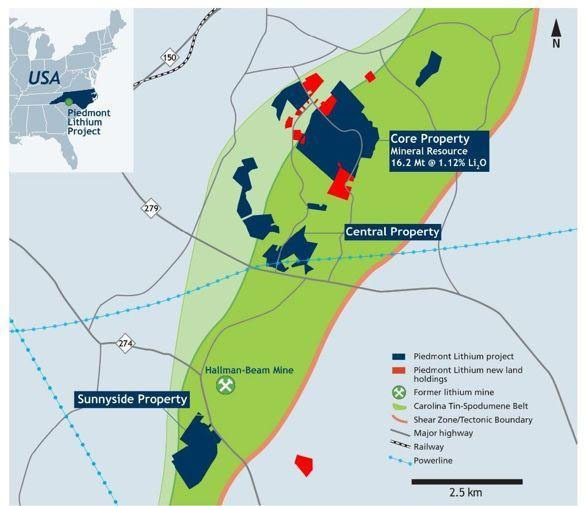 “With the advantages that accrue to an infrastructure-intensive locale like North Carolina, an upcoming expansion drill program and more targets available for testing on a large land position, Piedmont is ideally positioned to deliver leverage on rising lithium prices,” Lundin concluded. Piedmont’s shares on the NASDAQ currently sit at about $8.24, while its shares on the ASX currently trade at around AU$0.093. 2) The following companies mentioned in this article are billboard sponsors of Streetwise Reports: Piedmont Lithium. Click here for important disclosures about sponsor fees. 5) From time to time, Streetwise Reports LLC and its directors, officers, employees or members of their families, as well as persons interviewed for articles and interviews on the site, may have a long or short position in securities mentioned. Directors, officers, employees or members of their immediate families are prohibited from making purchases and/or sales of those securities in the open market or otherwise from the time of the interview or the decision to write an article until three business days after the publication of the interview or article. The foregoing prohibition does not apply to articles that in substance only restate previously published company releases. As of the date of this article, officers and/or employees of Streetwise Reports LLC (including members of their household) own securities of Piedmont Lithium, a company mentioned in this article.